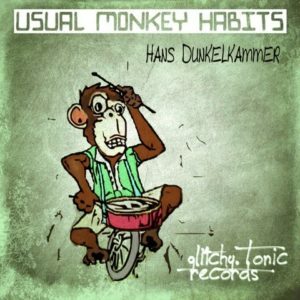 Usual Monkey Habits is the second installment of Hans Dunkelkammer on Glitchy.Tonic.Records, Germany. With more than 60 minutes of playtime Hans serves up individualistic sound spectra crossing the boundaries between progressive styles with jazzy and funky elements from 135 to 139 BPM. The album combines groovy rhythms and highly musical contents that will stimulate body and brain. After the debut Analgesic Underworld, Hans Dunkelkammer reaches the next level of artistic maturity and musical self-understanding with this sequel! MP3 Download | FLAC Download | WAV Download · Download count: 9,437. This works perfectly for me at morning to get awake when I’m still tired! I like the groovy minimalistic style of this album!